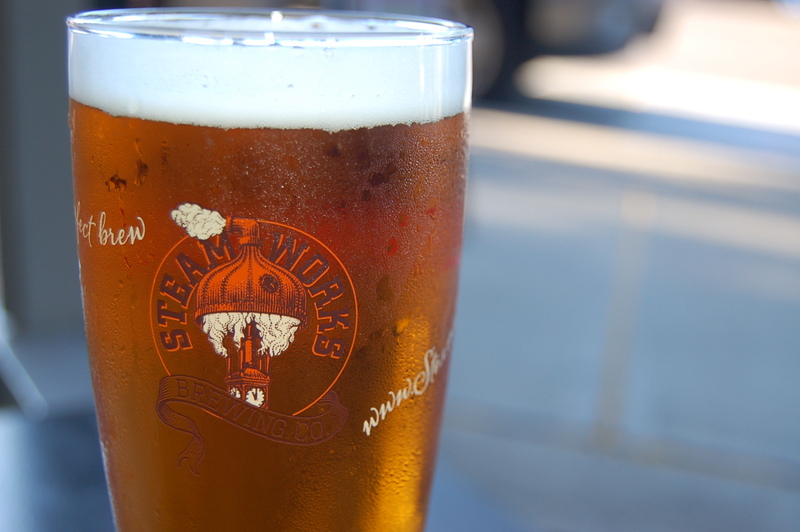 Vancouver is amidst a craft brewery boom. 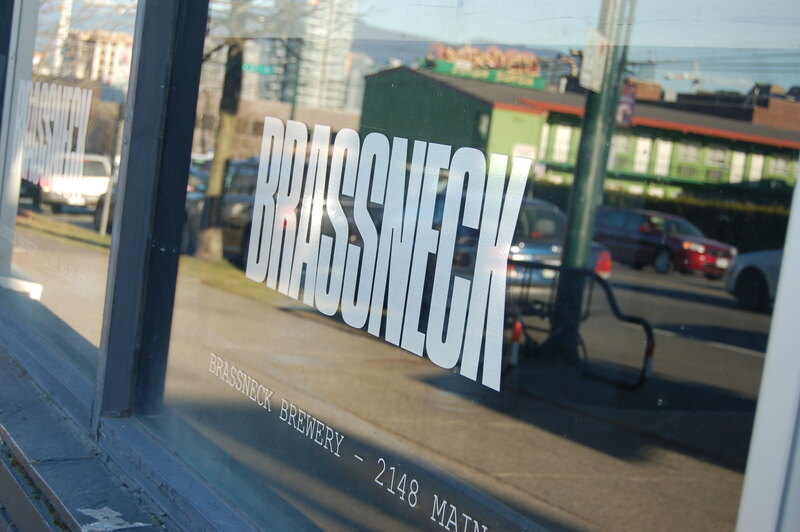 Among those recently opened, was Brassneck Brewery! 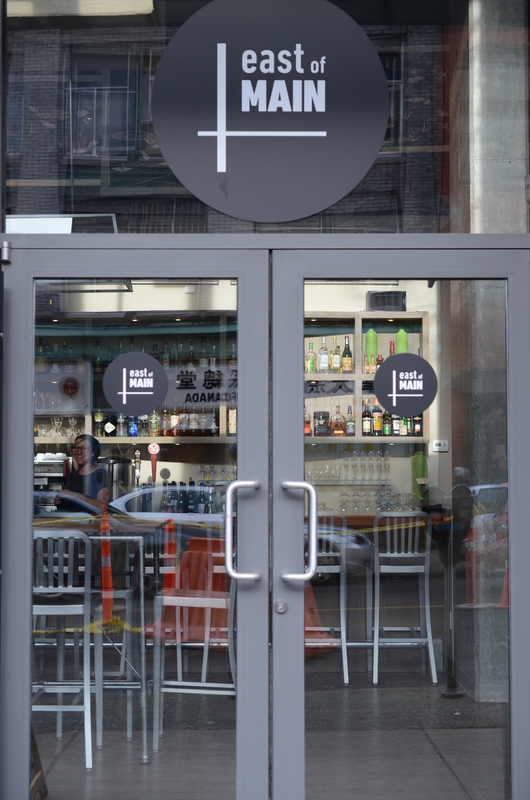 The August Jack opened up a few weeks ago on West 4th in Kitsilano, becoming Vancouver’s “first craft beer and food pairing restaurant”. Their focus is to pair an often rotating tap list of local and international craft beers with a selection of delicious tapas. 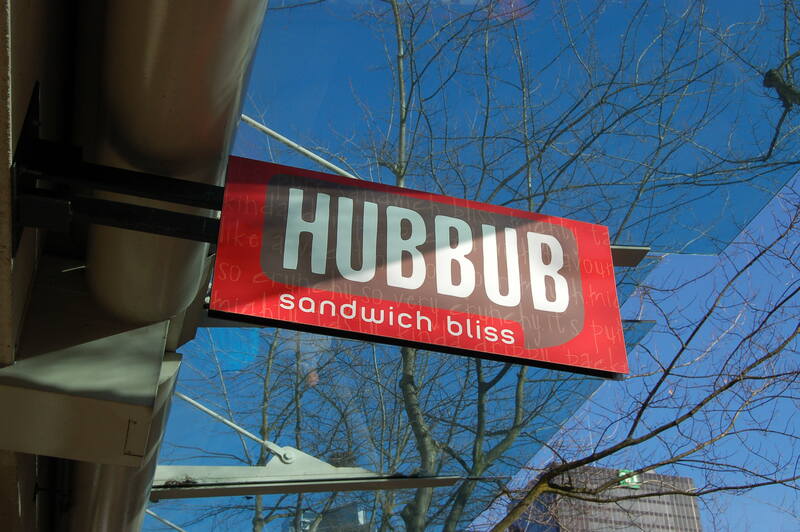 Once I heard that checking this place out became high on my priorities, even without a sandwich on menu. Finding The August Jack isn’t difficult, their massive black awning and big block lettered name almost call you over to check them out. Once inside the room is casual and comfortable. 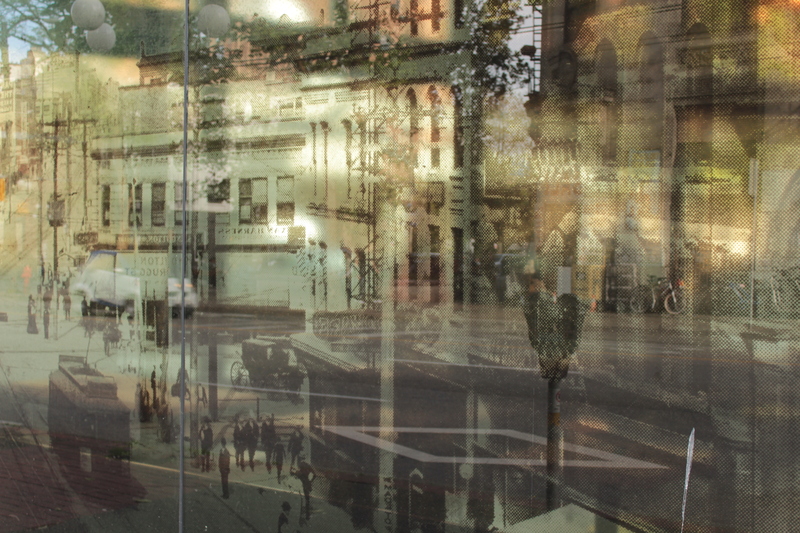 We were sat right at the front by the large bay windows that open right to the street. 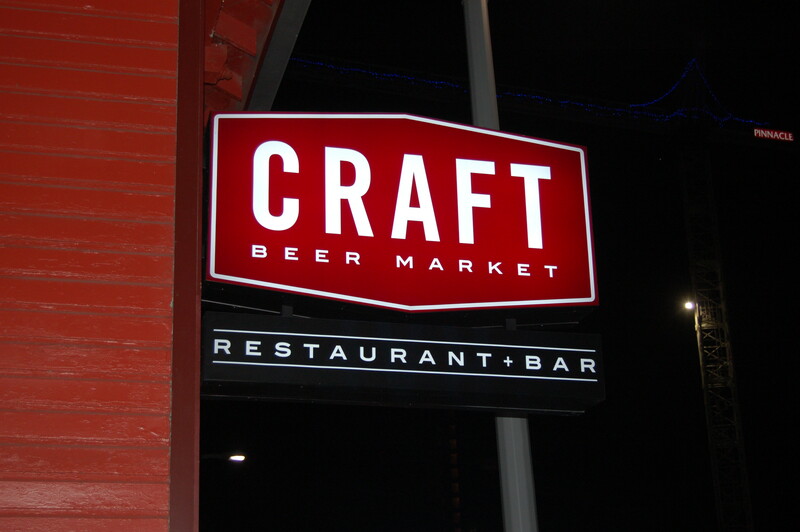 Not a bad little spot to sit and sip on some tasty craft beers and enjoy some great small plates. The first course was the Wild Mushroom Toasts paired Steamworks Pale Ale. 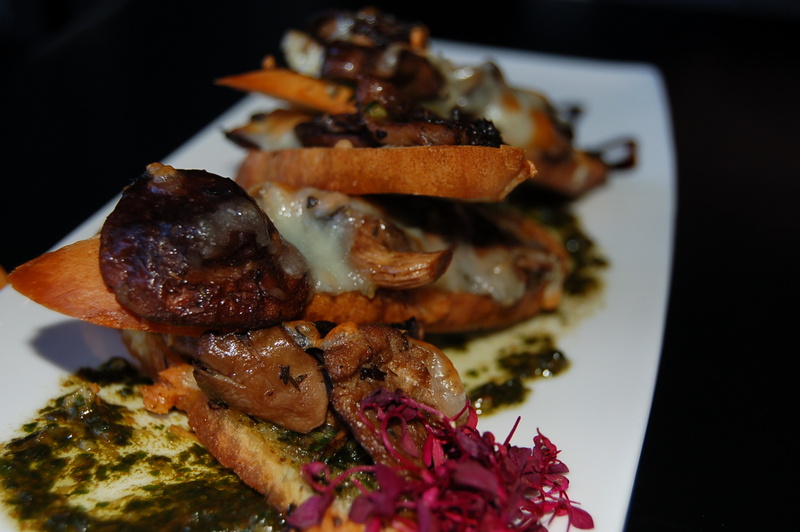 The toasts come with seasonal wild mushrooms, hazelnut basil pesto, shaved manchego and balsamic reduction. The first thing I detected was how the earthiness from the mushrooms really brought out the malt in the beer. The hazelnuts came through really nice in the pesto and the house baked rustic sliced baguette was nice and crunchy. The mushrooms really resonate on the palate and continue to linger with the beer as you enjoy the two together. This was a great start to the meal. The second course was the Pan Seared Beach Oysters paired with Unibroue Blanche De Chambly. 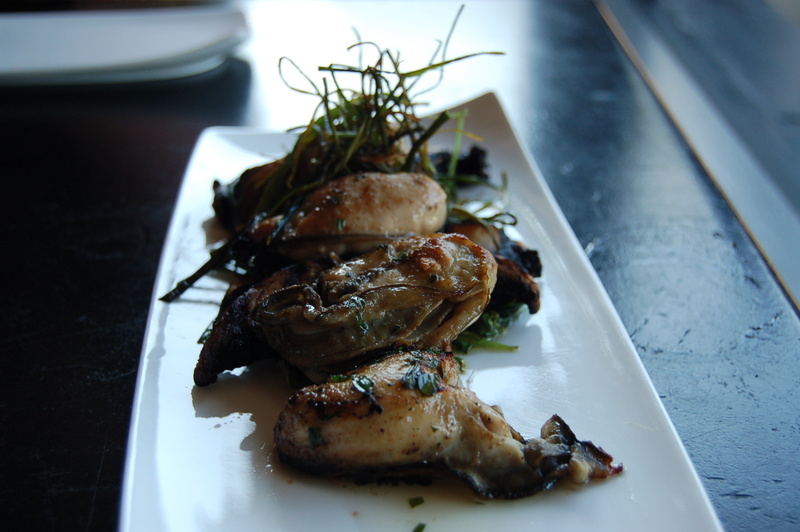 The big juicy oyster come tossed in browned tarragon garlic butter with grilled portobello mushrooms and crispy fried leeks. The beer pairing here is spot on. This Belgian style Witbier is perfect with the oysters. The beer’s flavor accents the richness from the buttered oysters, while also cleansing the palate with its fresh, crisp mouth feel. 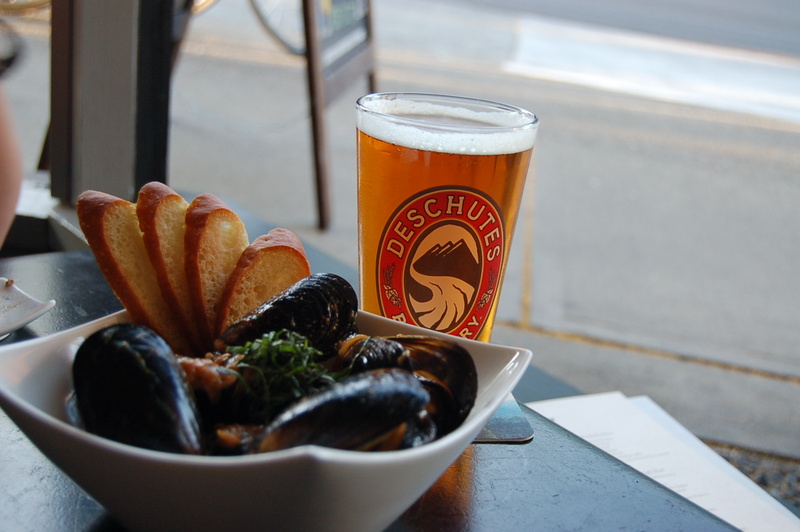 The third course was the Read Island Mussels paired with Deschutes River Ale. The mussels were in a delicious paprika rose sauce with basil and crème fraiche. The mussels were big and plump and super tasty. The sauce was tangy, with great acidity that was mellowed by the addition of the crème fraiche. This beer from Deschutes is a great one, perfect for summer with its mellow hop flavor and light body. So, next time you find yourself cruising down West 4th in Kits definitely pop into The August Jack for a great craft beer and delicious food pairing. 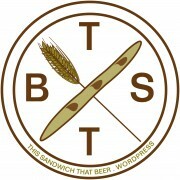 Follow them on Twitter @TheAugustJack and follow me @TSTB_blog. Bitter Tasting Room sits at the corner of Hastings and Carrall just outside of Gastown, and is another craft beer focused spot in the area. 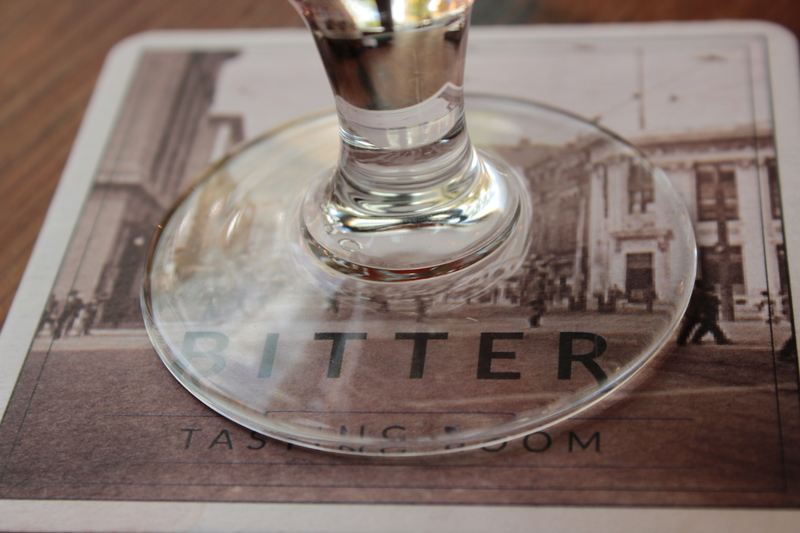 They have 8 (but I hear soon to be 14) rotating taps and the largest bottle selection in the city. 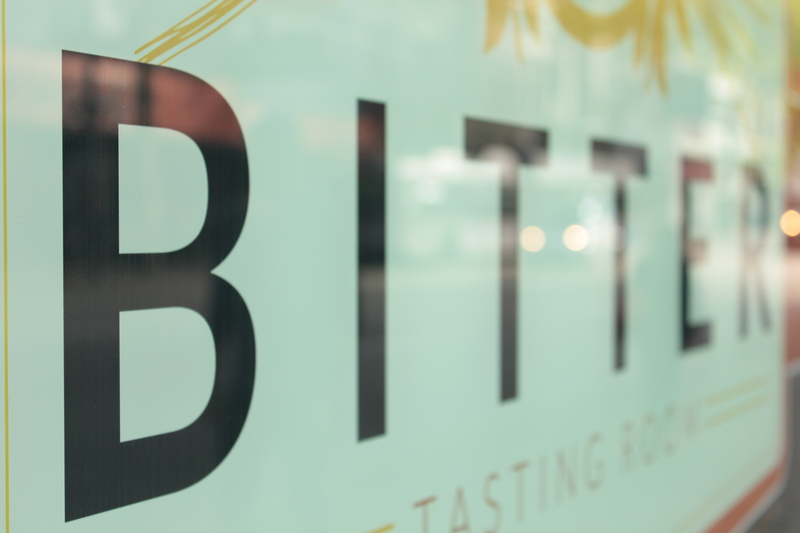 The menu at Bitter features a variety of classic bar snacks as well as some innovative and substantial mains. Popular menu items include the house made soft pretzels, smoked mackerel, an insane brisket stuffed meatball and my favourite, the scotch eggs. They also just recently added a really great pulled pork sandwich to the menu, which meant I had to get in there to pair that up with a killer craft beer. 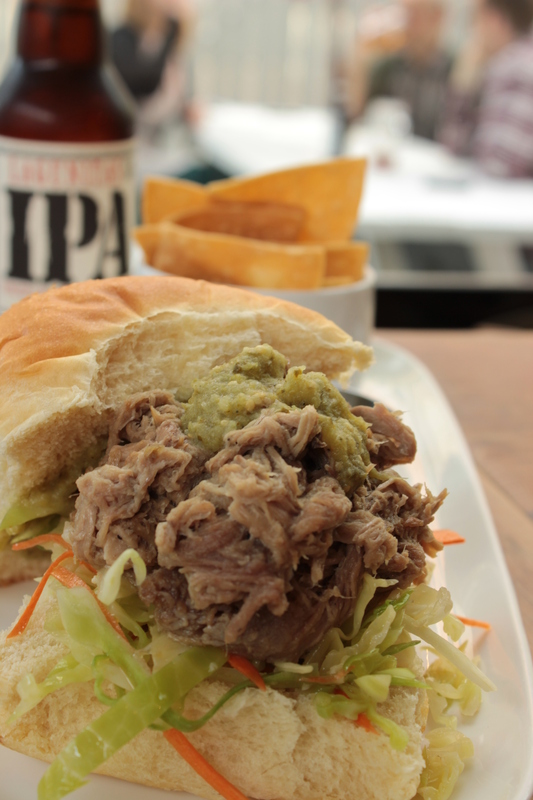 Now this pulled pork sandwich isn’t the pulled pork sandwich you might expect. It’s not that “Carolina-style” pulled pork or the smoky “Texas-BBQ” style either. This pulled pork sandwich has bit more of a southwest thing going on. 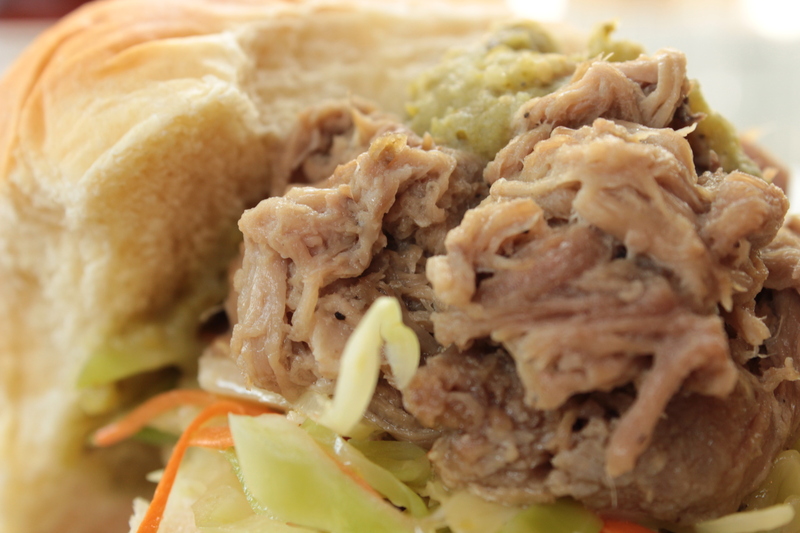 It’s loaded with juicy pulled pork, coleslaw and a zesty tomatillo sauce on a bakery fresh bun. The first thing that I noticed was the pork has real saltiness to it, which is different, as you often get a bit of sweetness from pulled pork. But the salt is nice when combined with the acidity from the crunchy cabbage slaw and tomatillo sauce. The slaw adds great texture to the sandwich as well. The tangy and slightly spicy tomatillo sauce totally completes this sandwich and makes it something truly original. The bottle selection at Bitter allowed for the luxury (and maybe struggle as well) of choice between several different great craft beers from all over the map. But I had one in mind that I was happy to hear they were stocking at the moment. The beer I chose to pair up with the pulled pork sandwich was the Lagunitas IPA. Lagunitas is great brewery out of California that is always coming out with great beers that are often a little “outside the box”. This IPA is not too far out from what we expect in BC, but it definitely has its very own unique flavor profile. The beer pours a nice orange colour with a big hop aroma and some citrus notes on the nose as well. 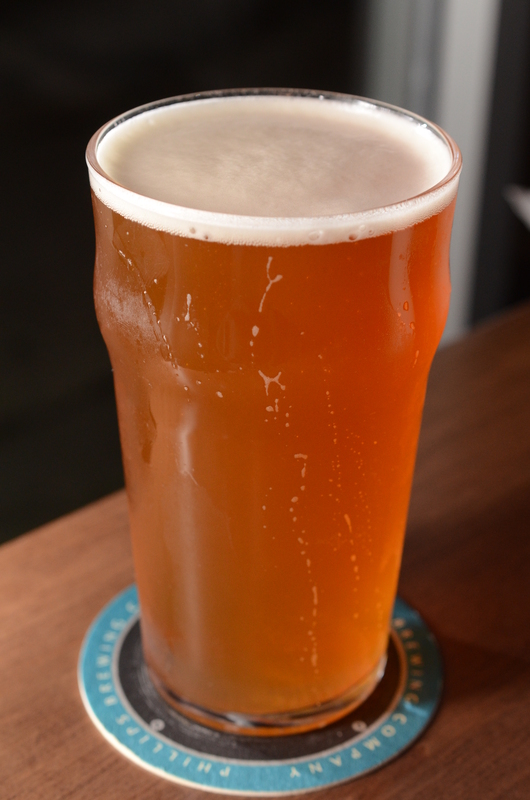 The Lagunitas IPA’s blend of malt and hops creates a great balance that has you really wanting another. The flavor is sweet as the malt is not lost or overpowered by the hops. This sweetness is perfect up against salty pulled pork and the slight spice from the tomatillo sauce. The citrus notes in the beer aslo go great with the tomatillo sauce and the hop bitterness cut the fattiness from the pork, really cleansing the palate. So, next time you’re looking for something a bit different from a pulled pork sandwich paired with a sweet but sessionable IPA then head to Bitter Tasting Room for This Sandwich and That Beer. Check out www.bittertastingroom.com and www.lagunitas.com for more info, follow them both on Twitter @bittervancouver and @lagunitasbruhws and follow me @TSTB_blog. 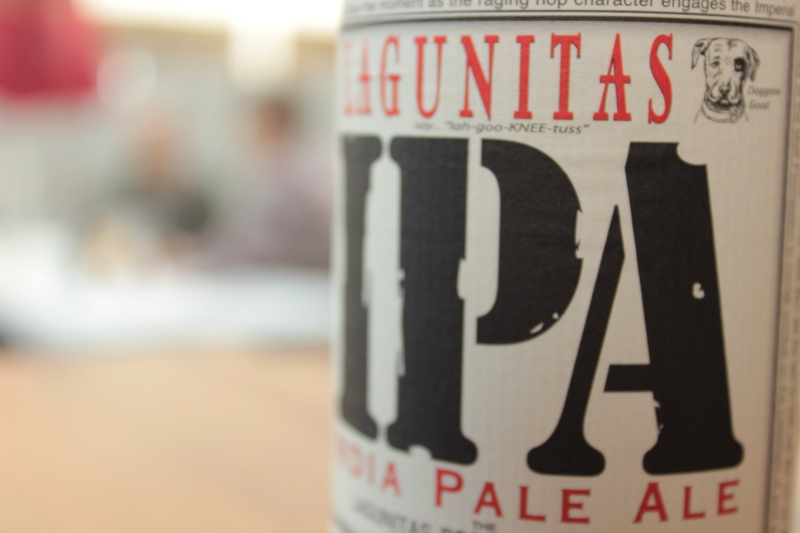 Head to Legacy Liquor if you’re looking to pick up a six-pack of the Lagunitas IPA. Also, catch my monthly radio feature on “Just Here For The Beer” on Team Radio 1410AM on June 29th at 12:00pm. 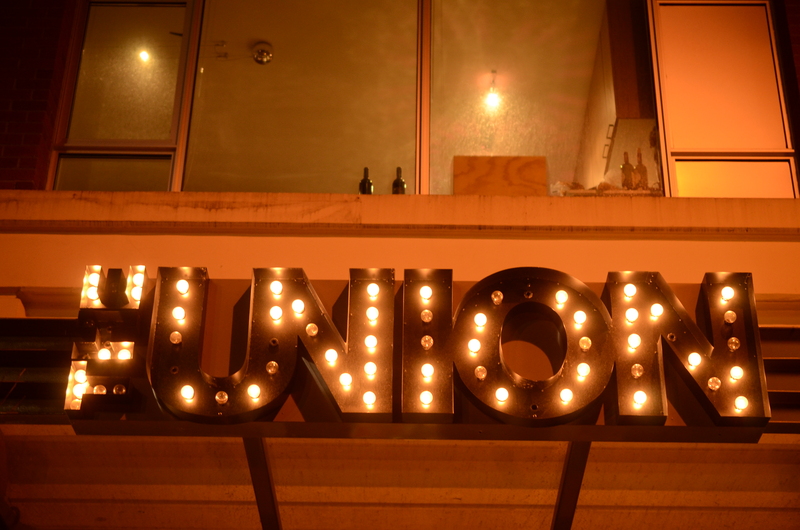 The Union sits on the edge of Vancouver’s Chinatown, where they’re doing a tasty combination of South-Asian cuisine. 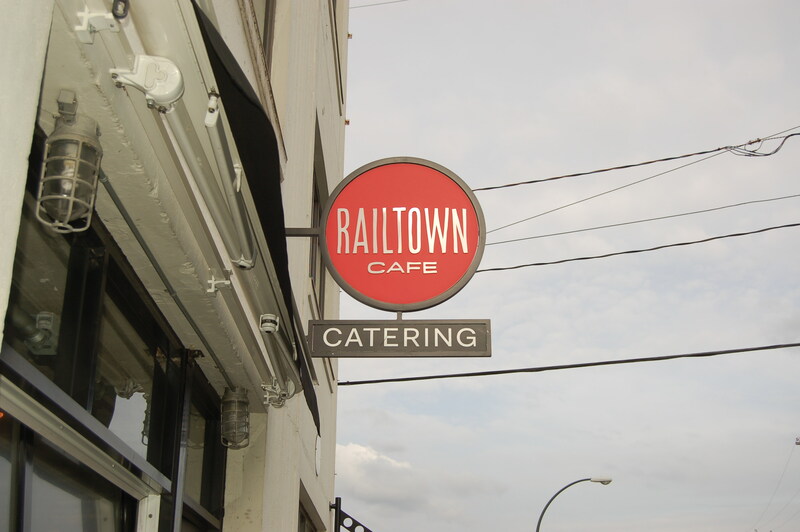 You’ll find their take on vermicelli bowls, pad thai, butter chicken and the famous Vietnamese sub known as the Banh Mi. Of course, I was in for one of the Banh Mi sandwiches, specifically the Fried Tofu Banh Mi, other options include Sweet & Sour Fried Fish, Crisp Pork Belly or Lemongrass Chicken. 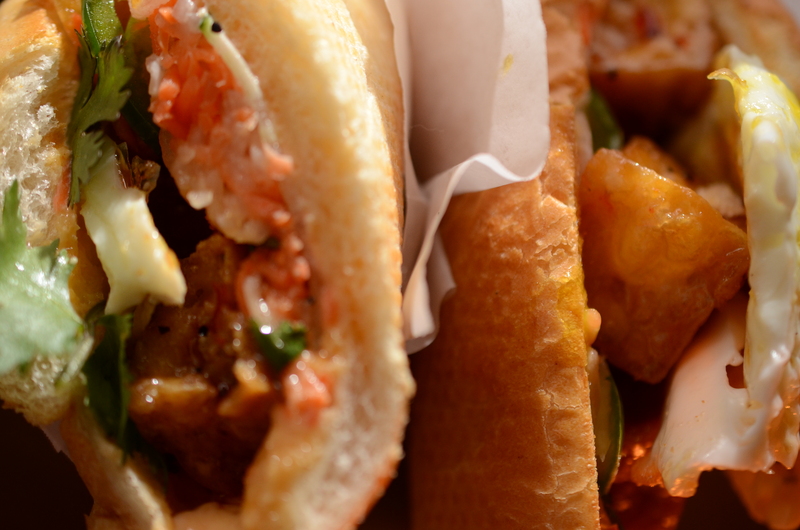 This sub style sandwich comes on a fresh French baquette with spicy sriracha aioli, fresh jalepenos, daikon & carrot pickle, cucumber and cilantro. As soon as the sandwich was placed in front of me the smells permeated into my nostrils. The scent of peanuts was the first thing I could detect, which I think came from the sauce that the crispy and moist fried tofu was lathered in. Nice heat came from the fresh jalepeno, but not so much that I was reaching for a glass of water (or my beer) after each bite. The pickled daikon & carrot brought a great acidity and a touch of sweetness, which was rounded out perfectly by the cool cucumber and cilantro. The fried tofu totally worked in place of a meat protein on this, and if you’re looking for a little something extra they’ll gladly throw a softly fried egg on there for you, which is what I did. Another small but cool thing about this sandwich is that it came in a bowl, which I thought was unique and presented the sandwich in a very picturesque way. 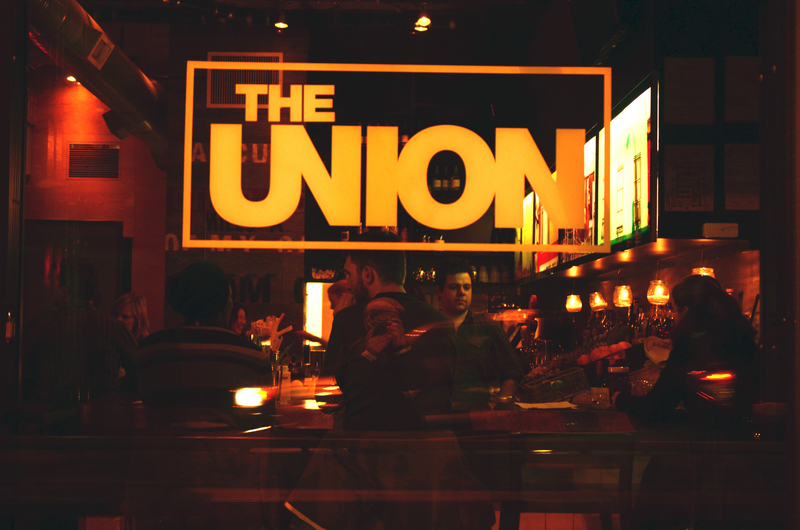 The Union, like many newer places offers a great selection of craft beer on tap as well as in bottles. The beer that piqued my interest the most was the Phillips Ginger Beer, which is one of the tap options. I find Phillips consistently offers up a great product no matter what the style. Now, I’d admittedly been apprehensive about this beer as I tend to steer clear of “flavoured” beer. But I quickly realized, this wasn’t a “flavoured” beer at all, it’s a true ginger beer. It had an instant ginger aroma and then an even stronger ginger taste, that even packed a bit of heat. This worked well with the heat from the jalepeno, and also mingled with the other ingredients in the sandwich. But even with all that ginger flavour, this is still a well-balanced, full-bodied and tasty lager. 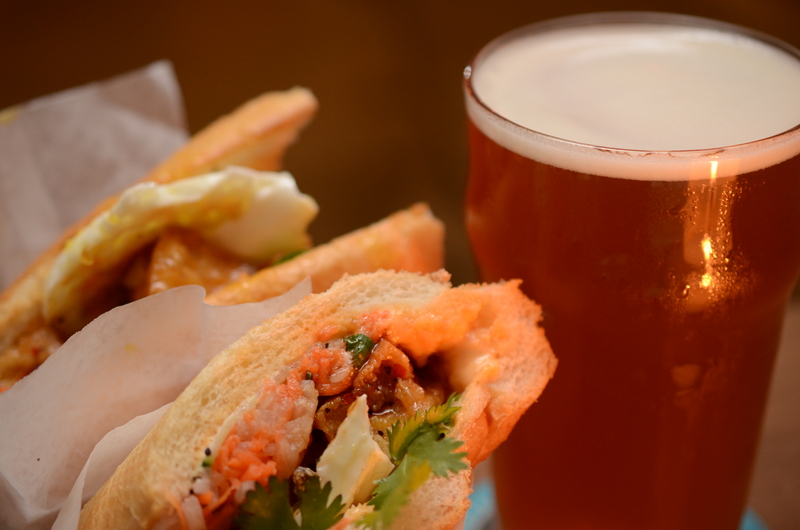 So if you’re looking for an elevated Banh Mi sandwich paired with a really interesting take on a true ginger beer, then head to The Union for This Sandwich and That Beer. Check out http://www.theunionvancouver.ca and http://www.phillipsbeer.com for more info, follow them both on Twitter: @TheUnionVan and @phillipsbeer, and follow me @TSTB_blog. Check Legacy Liquor Store if you’re looking to pick up a bottle of Phillips Ginger Beer on its own. Also, catch my monthly radio feature on “Just Here For The Beer Radio” on its new home Team Radio 1410AM, March 16th at 12:00pm PST. Awhile back I featured the Carne Guisada Bocadillo from El Caminos on my blog, after that El Caminos became a place I frequented quite regularly. 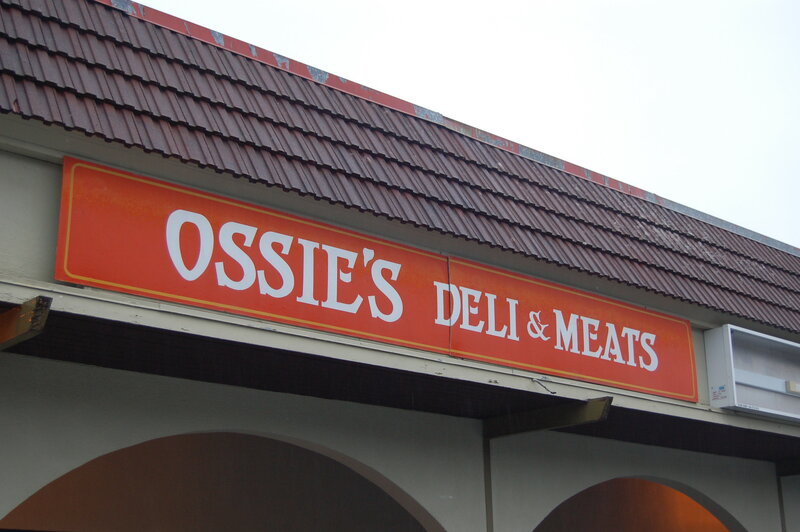 So, I thought I should hit up some of the other restaurants in their family. This brought me to Habit Lounge, which is only a few blocks north of El Camino’s on Main Street. 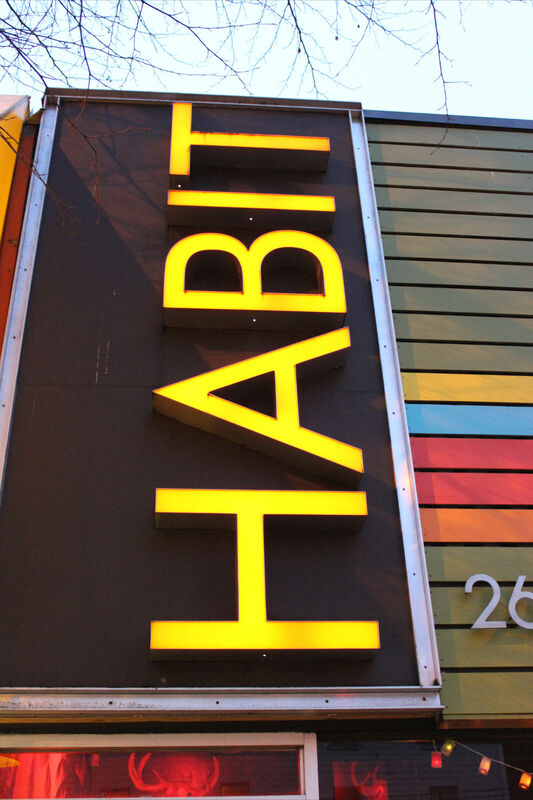 A modern tiki lounge if you will, Habit is low key, dimly lit and a great place to hang out for some drinks as well as grab a bite. I was in for their Crab Cake Sandwich, a generously sized crab cake loaded with crab, topped with crispy bacon, avocado, pickled onions, lemon aioli and greens on a soft, fresh Kaiser bun. This thing is mammoth! The crab cake is probably enough on its own, it’s nice and crunchy on the outside and moist and flavorful on the inside. The smoky bacon, soft avocado, lemon aioli, crunchy pickled onions and fresh greens combine to create a spectacular taste explosion. 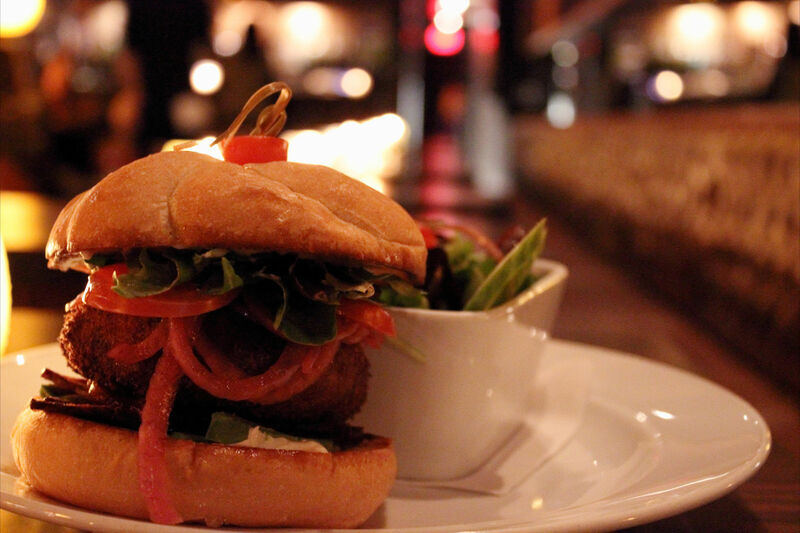 Each bite has crunch from the crab cake, bacon and pickled onions, and then a great soft texture also from the crab cake, as well as the avocado and the Kaiser bun. This sandwich satisfies on so many levels. I wanted to pair this sandwich a nice, citrusy wheat beer, so I was pumped when I saw the Blanche De Chambly by Quebec’s Unibroue on their extensive beer list. 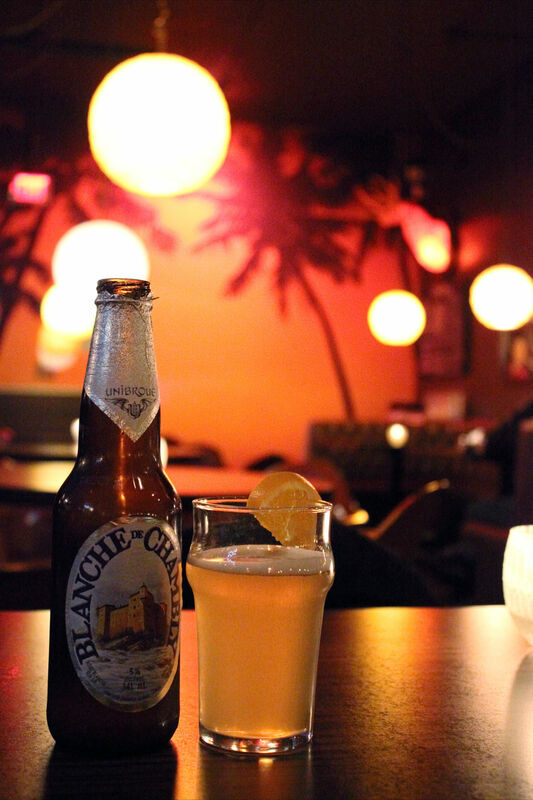 The Blanche De Chambly is the perfect partner to the crab cake sandwich, its spice and citrus notes are completely in sync with sandwich’s flavor profile. 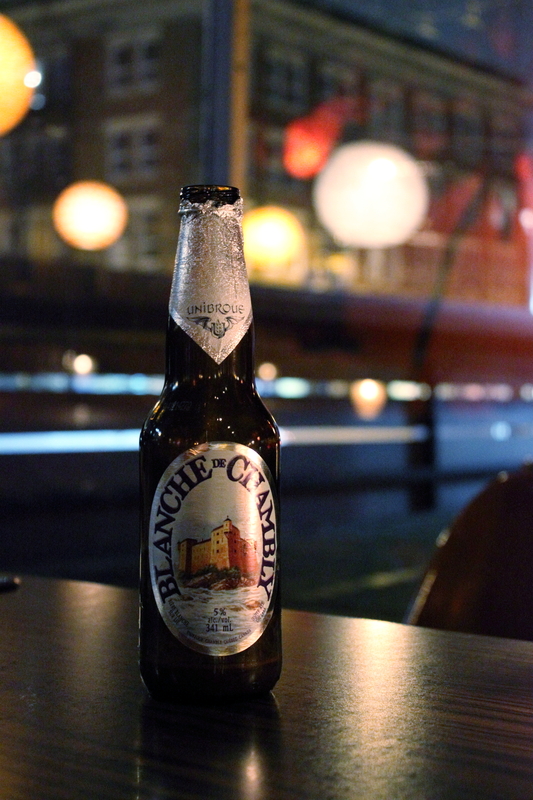 This Belgian Witbier pours a cloudy pale golden colour with a creamy white head. It has a crisp, champagne like mouth feel and is really refreshing. The fresh orange slice that came on the side of the glass only accentuated the citrus collaboration between this beer and the sandwich. This pairing would be perfect on a bright sunny day, sitting on Habit’s patio watching the uniqueness of Main Street pass you by. 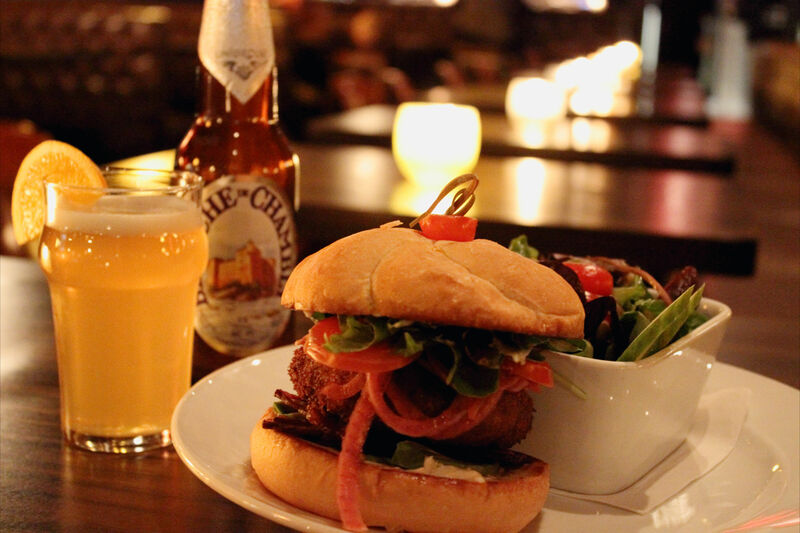 So if you’re looking an unreal Crab Cake Sandwich paired with a great Canadian made Belgian Witbier, then head to Habit Lounge for This Sandwich and That Beer. Check out www.habitlounge.ca and www.unibroue.com for more info, follow them both on Twitter: @habitlounge and @Unibroue, and follow me @TSTB_blog. 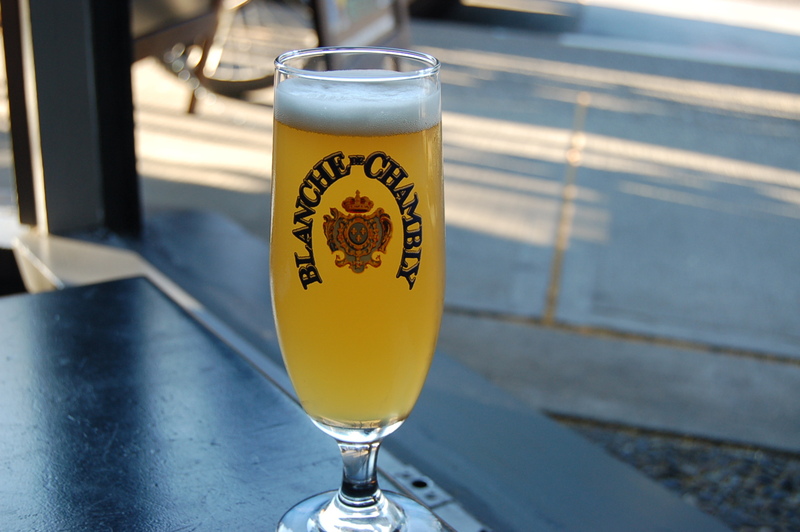 Check Legacy Liquor Store if you’re looking to pick up the Blanche De Chamblay for yourself. Also, catch my monthly radio feature on “Just Here For The Beer Radio” on its new home Team Radio 1410AM, the last Saturday of each month at 1:00pm PST. 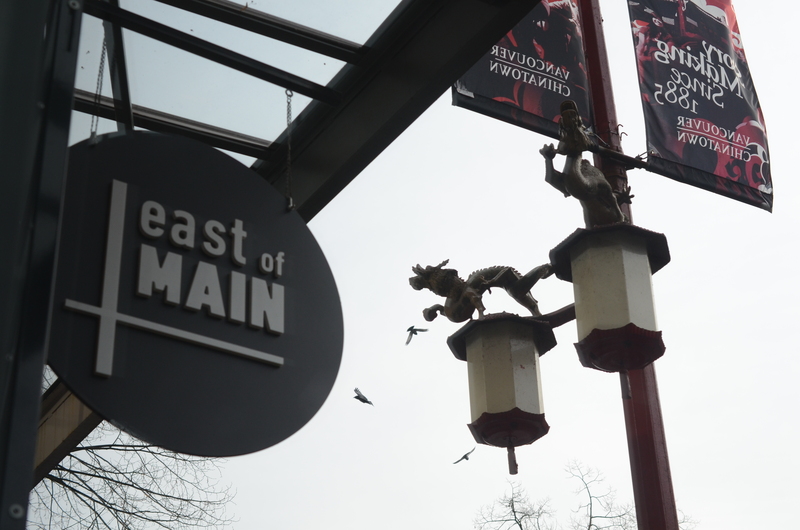 East Of Main Cafe sits in the midst of Vancouver’s Chinatown, surrounded by produce markets, spice shops and Asian restaurants. The menu is an eclectic mix of dishes created by Chef Jenny Patsula for dinner and lunch, including a selection of salads, tapas, mains and of course sandwiches. What they are doing is completely unique to the area, and it’s great. Another thing they do that’s great, is contribute all profits to a free performing arts program for young people living in Vancouver’s Downtown Eastside, Project Limelight. 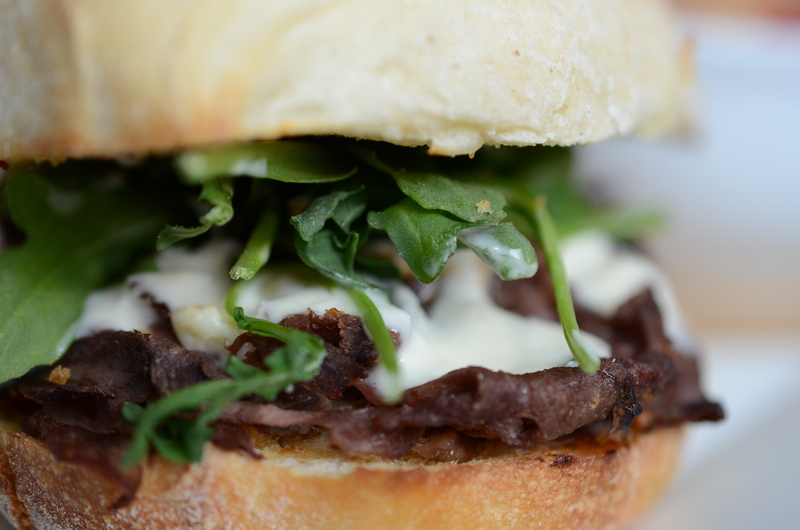 I opted to go for the “Roast Beef & Blue” with roast beef, blue cheese, roasted shallot demi, horseradish aioli, arugula and garlic butter on a fresh Portuguese bun. This sandwich is full of strong flavors, the blue cheese is pungent and the horseradish offers great heat. The roasted shallot demi is nice and sweet and the roast beef is tender and juicy, and deep in flavor. I love the arugula as the greens on this one, it goes great with sweet and garlic buttered Portuguese bun. Everything in this sandwich made sense, all the ingredients work with and enhance each other in every bite. The bar features an array of classic and signature cocktails created by bar manager Colin Turner, as well as well curated selection of local craft beers. I chose the Red Racer IPA from Central City Brewing to pair up with the “Roast Beef & Blue”. 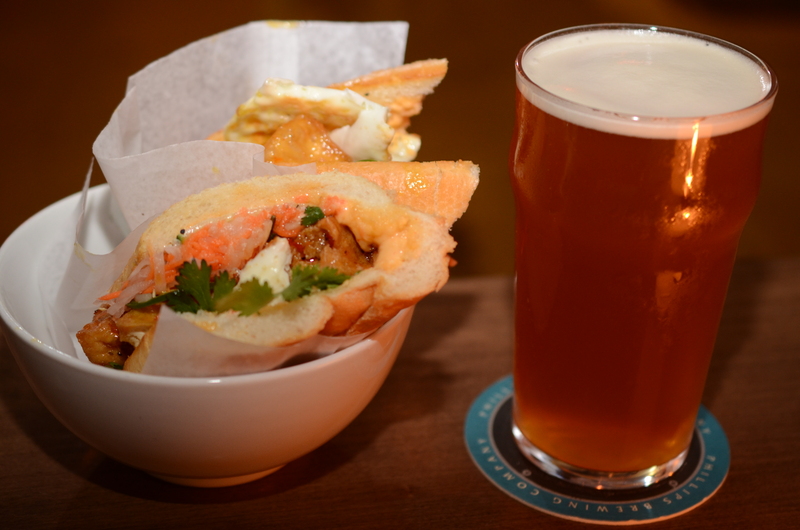 I thought the big flavors in this beer would match up great with the tastes of this sandwich. 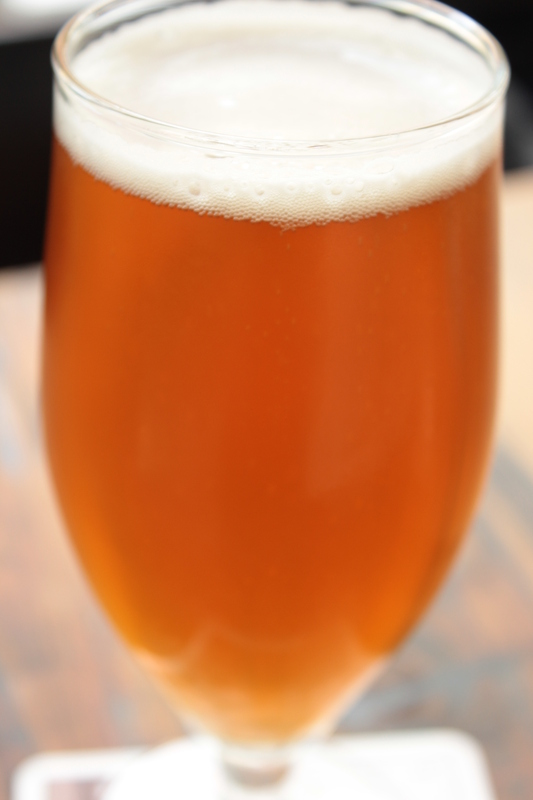 With its intense hop aroma this IPA, like most is a perfect match with roast beef. Its hop bitterness marries well with the subtle bitterness from the blue cheese; the beer is also nice with the heat from the horseradish aioli. Like the sandwich, this pairing made perfect sense, strong flavors are present in both and working together every step of the way. 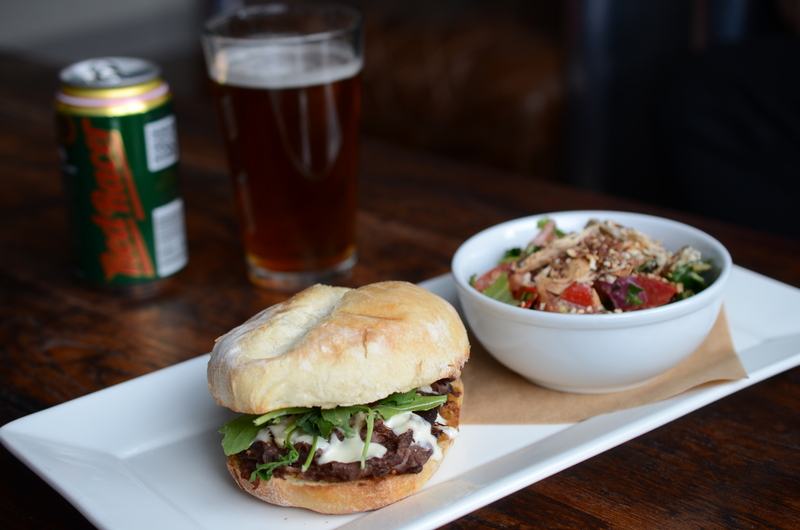 So if you’re looking for a really well thought out roast beef sandwich paired a big bold local IPA, then head to East Of Main Cafe for This Sandwich and That Beer. Check out www.eastofmaincafe.com and www.centralcitybrewing.com for more info, follow them both on Twitter: @eastofMAINcafe and @RedRacerBeer and follow me @TSTB_Blog. 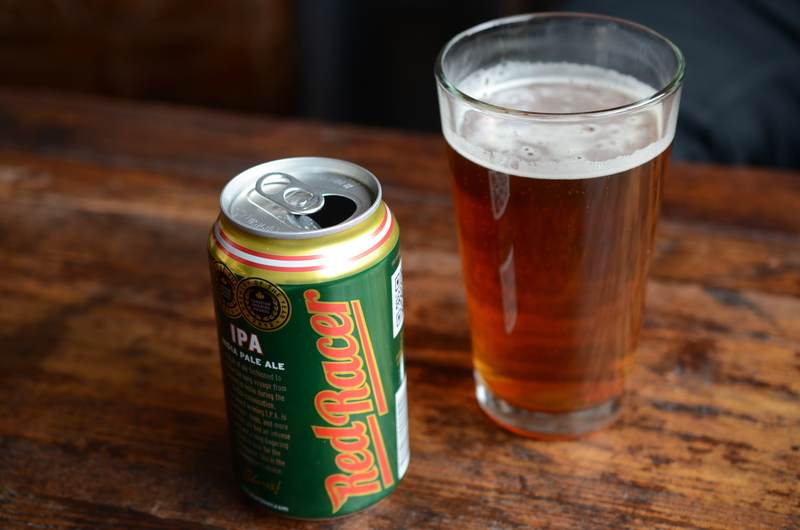 If you want to pick up a six-pack Red Racer IPA then head over the Legacy Liquor in Olympic Village to pick one up. Also, catch my monthly radio feature on “Just Here For The Beer Radio” on the TEAM 1410.